Two days ago, I called an informal meeting and gathered the guinea pigs…I mean the family. I presented them with an idea and after a couple rounds of eyeball rolling, they seemed to warm up to the idea. 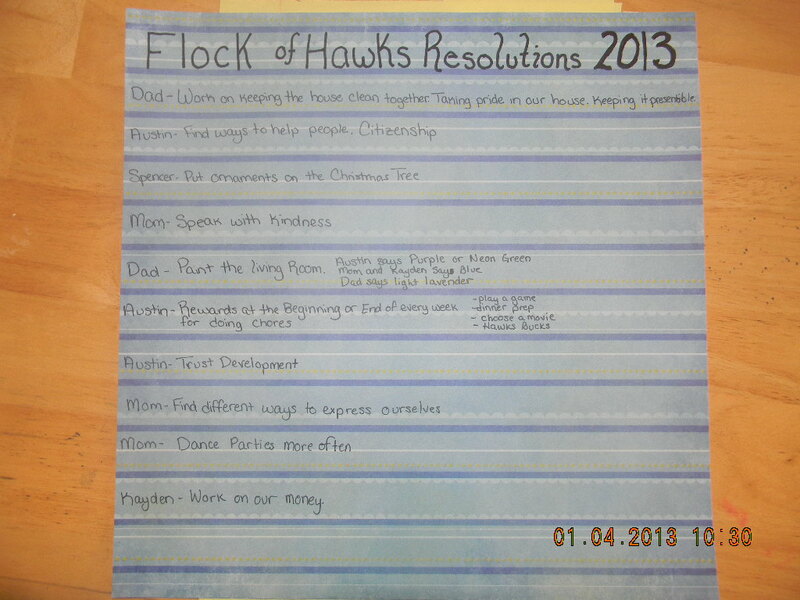 My plan, I told them, was to come up with a set of resolutions that we would work on as a family. Once the kids started brainstorming, they didn’t want to stop. I wrote every suggestion down, no matter what opinions were expressed about it. Those suggestions that didn’t really work for the family list were tabled for personal lists. For example, from the brainstorm list, Kayden added that we should all work on the Pledge of Allegiance and the Boy Scout Motto. He explained that this was so that he could learn them better. This, I told him, wold be a perfect goal for his personal list. His eyes lit up and I could see him plotting the other items on his own resolution list. Austin wanted us all to get fit, specifically by doing push ups. Uhhh….Chris and I exchanged glances. Yes, we all need to get in better health, but A) Momma‘s not a push up kind of person and B) that needs to be an individual goal. Right before I sat down to work on this post, I transferred the list to a 12 x 12 scrapbook paper. After I post this, I will find a great, eye catching place to hang it. I am looking forward to reviewing these next year to see where we are and what our new goals are! For now, I will look back at how far we have come in the last six years that have brought us to the point where we can make such a thoughtful, heartfelt list.